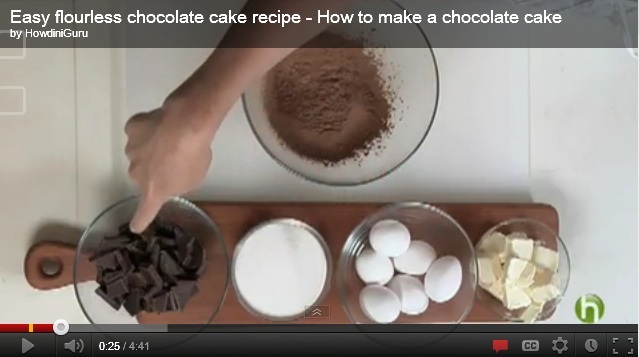 A chocolate cake recipe is one of the easiest and yummiest desserts to prepare at home. You can serve it plain, with cream, with various kinds of frosting, with ice cream, jelly, coffee, tea etc. You can eat the cake warm or cold and never go wrong with it. Here is a plain chocolate cake recipe for easy baking with scrumptious frosting. – Grease and flour three 10-inch cake pans. – In a mixing bowl, whisk the salt, flour, cocoa powder, baking powder, baking soda and sugar. Make sure that there are no lumps in the mix. – In a separate bowl, take 1 cup + 2 tablespoons of water and 1 cup + 2 tablespoons of canola oil and mix them together to get an emulsion. – Take the eggs, 3/4 cup of water and vanilla and whisk them using an electric blender for 2 minutes. – Add the oil and water mix and blend well. – Now add the dry ingredients to the above mix and combine all the ingredients well to get a smooth mix. – Pour the prepared mix in the greased cake pans, filling each cake pan up to 3/4 level. – Bake in the preheated oven for 25-35 minutes. Check after 25 minutes by inserting a toothpick in the center. – Remove from the oven and cool for about 15 minutes before removing the cakes from the pans. – Wrap the cakes in foil and freeze for 2 hours before using. – In a double boiler, take the egg whites and sugar and whisk continuously until the sugar is dissolved and the egg whites are hot. – Remove from the heat and whisk some more to get a glassy mix. Let it cool. – Cut the butter in small cubes. – Add the butter to the egg mix and use a paddle attachment to incorporate the butter in the eggs and get a smooth mix. – Add the vanilla and salt and mix well. – You can add various flavors and color to this frosting. – Place the cakes on top of each other with a thick layer of frosting in between each of them. – Cover with remaining frosting on all sides. – Chill in the fridge before serving. The red velvet cake is essentially a chocolate cake but it has an attractive red color that makes it the perfect cake choice for Valentine’s Day. This Valentine’s you can surprise your loved ones with one of my favorite red velvet cake recipes from scratch. This red velvet cake recipe is shaped like balls and then dipped in chocolate. – Preheat the oven to 325F. – Whisk the cocoa powder, hot water and red food coloring in a bowl. Set aside to cool. – In a separate bowl, take the butter and shortening and whisk together to get a smooth mix. Add the sugar and mix some more. – Break in the eggs, one by one, and beat at a low speed using an electric mixer until you get a fluffy smooth mix. – Add the buttermilk and vanilla to the cooled cocoa mix and whisk well. – Sift the cake flour and baking soda in a bowl and divide the mix in two parts. – Whisk one part in the egg mix and the other in the cocoa mix. – Fold the two parts together. – Stir in the vinegar last. – Pour the prepared batter in a greased 9-inch pan. – Bake in the preheated oven for about 1 hour or until a skewer inserted in the middle comes out clean. – Remove from the pan and cool completely before preparing the balls. – Once the cake is cooled completely, crumble it in a large bowl. The cake is moist so don’t worry if it sticks a little. – Add the cream cheese frosting to the crumbled cake and mix well. – Use your hands to roll the cake mix into small balls. – Freeze in the refrigerator for about 2 hours. – Melt the chocolate in the microwave. – Dip the cake balls in the melted chocolate until coated from all sides. – Set the balls on a parchment paper until firm. – Drizzle the cake balls with a little caramel sauce and cool in the fridge till it is time to serve. Many people find it hard to believe that you can make delicious cakes without eggs. In fact, vegan recipes are quite easy to follow and the carrot cake recipe turn out to be as delicious and moist as any other cake. 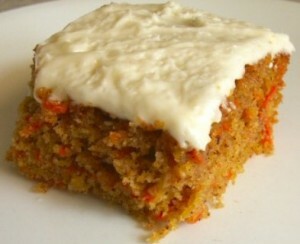 Here is a simple vegan carrot cake recipe that you can try out at home. – Grease and flour three 9 inch cake pans. – In a mixing bowl, sift the flour, salt, baking powder, baking soda, ground cinnamon, ground nutmeg, ground ginger and egg replacer. – In a separate bowl, add the sugar, safflower oil and almond milk and whisk well until combined. – Add the applesauce and whisk some more to combine all the liquids. – Add the almond milk mixture to the flour mixture and whisk well to form a smooth batter. – Gently stir in the grated carrots, raisins and walnuts. Scrape the sides of the bowl to make sure all the ingredients are combined well. – Pour the batter in the three pans equally. – Bake in the preheated oven for about 25 minutes. The center of the cake should spring back when pressed. – Remove the pans from the oven and invert on wire racks to cool completely. – While the cakes cool, beat the margarine in a separate bowl till light and fluffy. – Cut the cream cheese in pieces and add to the margarine and beat well to combine fully. – Stir in the powdered sugar and vanilla and blend well. – Place one cake on a serving stand. – Spoon some of the frosting on top of the cake and spread evenly. – Place another cake on top of the first cake and press lightly. – Spread another layer of frosting on the top. – Place the third cake on top of the stack and cover with frosting from all sides. – Set aside for at least 30 minutes before serving. Cut in slices to serve. Whenever you are in a fix and are wondering what to make for dessert then a chocolate cake recipe is your best bet. It does not take much time to make and is loved by one and all. You can add many different ingredients to the cake and make it interesting. Here is a simple flourless homemade chocolate cake recipes that your family will surely love. – Grease a 9-inch spring form pan. You can use a little butter for this. – Chop the chocolate in small pieces. – In a large bowl, add the chocolate and butter. Put this bowl in a double boiler. Make sure that the bowl containing chocolate does not touch the water. – Let the butter and chocolate melt completely and stir well to mix. – Separate the egg whites and egg yolks. – Add the sugar to the egg yolks and beat well for about 5 minutes until it is light yellow in color. – Add 2 tablespoons of chocolate mix to this and set aside. – Beat the egg whites until stiff peaks are formed. Gently fold the rest of the chocolate mix in the egg whites. – Add this to the egg yolks mix and gently mix. – Pour the prepared batter in the greased pan. – Bake at 350F for about 40-45 minutes. Start checking from 35 minutes. The crust of the cake is supposed to be cracked but we don’t want it to be too crunchy. – Check by inserting a toothpick in the center; if it comes out with moist crumbs clinging to it then the cake is done. – The cake will be firm on top and slightly wobbly in the center. – Remove from the oven and cool for 10 minutes. – Once the heat is out, cover the cake with a damp towel to prevent it from cracking up further. – Whip the cream till it becomes fluffy. – Dust the cooled cake with icing sugar and serve with whipped cream on the side. – You can also dust come cocoa powder on the cake for more flavor. – Slice some strawberries and cherries and decorate the cake with them. – You can also spread the whipped cream on the top of the cake and decorate with grated chocolate shavings. Delicious, wow, wonderful, tasty, yummy – these are all the compliments that you are going to get if you follow this simple red velvet cake recipe from scratch. 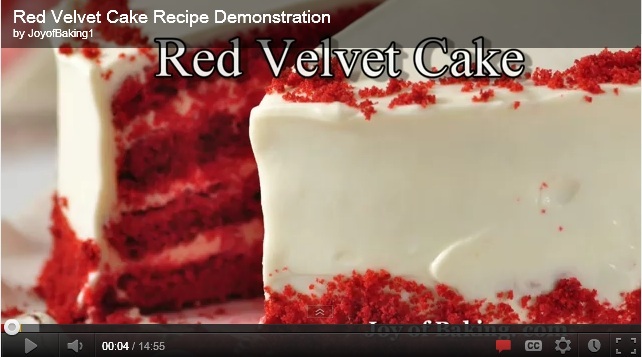 This red velvet cake recipe is easy to follow and uses simple ingredients. We have listed beet juice (which was the original source of red color in classic recipes) but you can easily substitute it for red food coloring. – Grease two 9-inch pans and dust the insides with a little flour. Pat the excess flour out. – Separate the egg whites from the yolks. – Take the egg yolks in a bowl and add the sugar to them. Beat well to let the sugar dissolve a little. – Add the cocoa powder and mix well. – Beat in the butter to get a slightly fluffy mix. – Now add the buttermilk and beet juice to the mix and whisk well to combine. – In a separate bowl, beat the egg whites until they double up in volume. – Add vinegar, salt and vanilla to this and beat some more. – Sift the cake flour and baking powder together. – Add the flour mix to the butter mix, one tablespoon at a time, and blend well. – In the end you will get a nice, uniform red color in the batter. – Gently fold in the egg white and vinegar mix and stir by hand. Make sure that you scrape the sides of the bowl to get an even mix. – Pour the batter in the greased pans and bake them at 350F for about 25-30 minutes. – Cool for five minutes, invert on a wire rack and let the cake cool completely before applying frosting or cutting in slices to serve. – You can also make red velvet cupcakes using this recipe. Pour the batter in cupcake molds (makes 24) and bake them at 350F for about 10-15 minutes. Traditional cream cheese frosting goes best with red velvet cake, but you can use standard chocolate glaze or frosting over it, or simple fluffy white frosting. Toasted coconut also tastes great with this cake. – Line a baking sheet with foil and spread the shredded coconut on it in a fine layer. – Bake at 350F for about 6-8 minutes, tossing in between for even cooking. – Remove from the oven and let it cool. – Sprinkle the coconut over the icing to cover from all sides. Cakes are one of the easiest desserts to make. You can eat them as they are or turn them into beautiful desserts. However, cakes do not always have to be too sweet or too fattening for your health. You can use other ingredients, such as carrots, to make the carrot cake recipe and enjoy the same taste with enriched goodness. Here is a healthy carrot cake recipe for you to try out the next time you feel a craving for cakes. – In a deep bowl, break in the eggs and add the sugar and olive oil to it. – Beat well until all the sugar is dissolved. – In a separate bowl, sift the baking powder, baking soda, flour, cinnamon and orange zest. 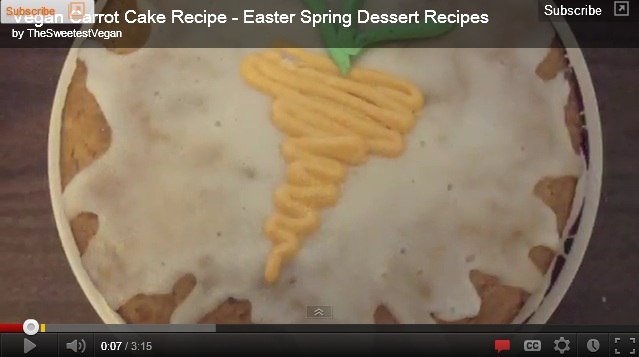 – Add the flour mix to the egg mix and whisk well. – Add the dried figs and mix well. – Add the grated carrots to the prepared mix and fold lightly. – Grease and flour a standard 9-inch cake pan. – Pour the batter in the pan. – Bake in the preheated oven for 35-40 minutes. The cake should be firm on the top and springy. You can check the cake by inserting a toothpick in the center; if it comes out clean the cake is done. While you can eat the carrot cake fresh out of the oven, you can also jazz it up a little using the following frosting options. – Beat the cream cheese and butter together till fluffy. – Gradually add the confectioners’ sugar and mix well. – Stir in the vanilla and chopped nuts. – Spread the frosting on the cake and let it sit for some time before cutting in slices and serving. – The ingredients and method are the same, but replace the chopped walnuts with 2/3 cup of toasted coconut shavings. – Spread on the cake in a thick layer and chill before serving. – You can also add toasted macadamia nuts and some crystalized ginger on the top of the frosting before serving. Children of all ages love chocolate cake at all times and when it is their birthday, the cake just has to be special otherwise the party will not be complete. Most parents go out and find the best First Birthday Cake Recipes that they could find, as parents when our baby turns 1 year old we want it to be extra special. Here is a simple mermaid white chocolate cake recipe that you can make for your child’s first birthday. – For assembling this cake you will need one 19cm diameter and one 23cm diameter round cake pans. – Grease and flour the cake pans and set aside. – Preheat the oven to 160C. – In a large saucepan, place the milk, white chocolate, salt, butter and sugar. Heat on low heat and stir continuously. Let the butter and chocolate melt completely until you get a smooth mix. – Remove from the heat and cool for 15 minutes. – Beat the eggs well and add the vanilla to the eggs. – Add the eggs and vanilla to the chocolate mix. – In a separate bowl, mix the flours together. – Add the flours to the wet chocolate mixture and mix well so that there are no lumps. – Pour the batter in the cake pans and bake in the preheated oven for about 1 hour and 15 minutes. Insert a knife in the center and if it comes out clean the cake is done. – You can either ice the cake immediately or freeze it to use later. – Prepare the blueberry jelly using 2/3 of the water as mentioned on the packet. This will keep the jelly from setting completely. Cool. – Place the larger cake on a serving plate or cake stand. – Make a well in the center of the smaller cake. – Place the small cake on top of the large cake. – Melt the white chocolate on a double boiler. 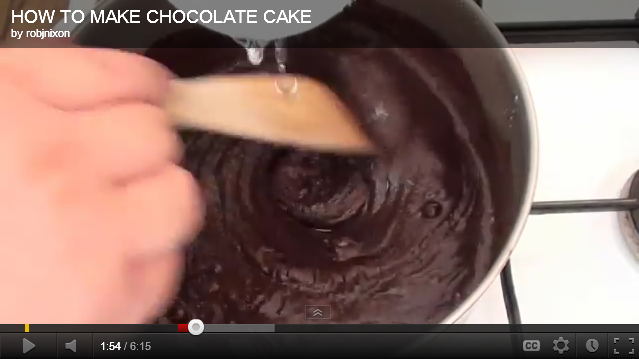 Use the melted chocolate to cover the cake from all sides and let it set. – Pour the blueberry jelly in the well. This will make the mermaid pool. Banana cake recipe are very simple yet delicious and moist on the inside and make the perfect dessert. Given below is an interesting variation of the popular banana cake in the form of a banana pudding cake recipe, which is served with a glossy glaze that adds to the taste. – Grease and flour a 9-inch cake pan, or you can also use a Bundt pan. – Open the packet of yellow cake mix and pour the contents in a large bowl. – Add the pudding mix contents to this and mix well. – Make a well in the center and break in the eggs, one by one. – Use an electric beater at high speed to mix the eggs with the cake and pudding mix. – Add the mashed bananas, vegetable oil and water. Beat at low speed for about 4 minutes. – Pour the prepared batter in the pan and shake the pan slightly to remove the air bubbles. – Bake in the preheated oven for 45-50 minutes till a toothpick inserted in the center comes out clean. – Remove from the oven and let the cake cool for about 15 minutes in the pan. Remove from the pan and let it cool on a wire rack. While the cake cools you can prepare the glaze. – Mix the milk, sugar and vanilla and whip the mix well till you get a drizzling consistency. – Drizzle the glaze on the cooled cake in a circular fashion. Garnish with the chopped walnuts and let it cool a little before serving. Tips: If you don’t like the cake mix in the market, you can make your own low-fat cake mix. – Take 5 1/2 cups of flour in a bowl and add the salt, sugar and baking powder, and combine well. – Cut the butter in small cubes and add the rest of the flour to it. – In a food processor, blend the flour and butter mix till it is very fine and without any lumps. – Add this mix to the dry flour mix and blend well. – Divide in 3 equal parts and store each part in an airtight bag or jar. – This cake mix will last in the freezer for up to 3 months.